I’ve recently added a new kayak to my quiver, in the form of the Fatyak Kaafu. I’ve bought it as it’s a perfect all rounder and it’s great to have as another kayak for my girlfriend or mates to take out. At almost 10 foot, the Kaafu is an excellent size; big enough to paddle quickly in varying conditions and to have loads of fantastic features packed into it. 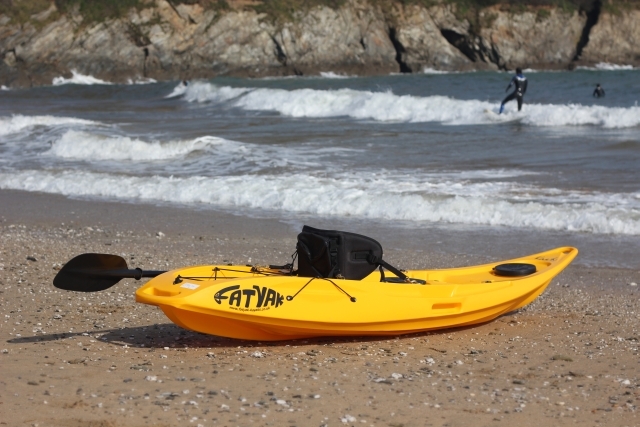 Although sizable, the yak is remarkably light at just 20kgs, this makes maneuvering into the water and car topping a breeze. It is one piece rotationally moulded, which means no seams or joints. It’s manufactured in Somerset, England, using high grade and high density UV stabilised polyethylene. I bought the additional Komfort seat that you could call an accessory, although I’d say a descent seat in any kayak is an absolute necessity if you plan on paddling any distance! The seat buckles on with four brass fittings and is highly adjustable to allow for all sizes and shapes of people. My favourite thing about the Komfort seat is that it has a zip pocket on the back of it, which is excellent for stashing a drink, snacks, suncream, sunnies or fishing tackle. In the water the Kaafu paddles like a dream, it’s nimble and agile in the surf and on the flat it tracks straight and true. It covers distance on the water easily and without fuss, which makes it great for touring and exploring. If you flip the kayak over you will see that the yak has very well designed lines underneath that gives it these good paddling qualities. Behind the seat lies the rear storage area which has bungee cord to keep all your gear safe on the back. This is brilliant for long days out on the water, as you can load it up with stuff for your travels. I’ll regularly load up with food and equipment and paddle out to a beach that is only accessible from the sea and have the ultimate outdoors lunch. One of the ways the Kaafu differs from my other kayaks, is its handles. The Kaafu has moulded in handles on the front, back and sides. They are big, strong grip holes that give you loads of room to hang on to when carrying and maneuvering your yak. I really like the large side handles that give you a great hold to grab onto when climbing back into the kayak if you fall out when surfing or fooling about. Two internal dry storage hatches give you more options when storing goods. Although they’re not massively spacious you can still pack small gear such as your phone, camera, snacks or possibly fishing tackle. When testing the kayak, I was really impressed with how impermeable these hatches were. Even though I had the kayak upside down and covered in spray at times, the hatches did not let a droplet of water inside. On either side of the Kaafu there is a place to stash your paddle. This is uber useful and you really don’t want to get a kayak that doesn’t have a paddle secure point. There are loads of moments when having your paddle “hands-free” is essential, especially when fishing. I normally paddle to a location, store the paddle and start casting. You don’t want to be worrying about your paddle floating off and sinking when you’re just getting into a some serious bass action. 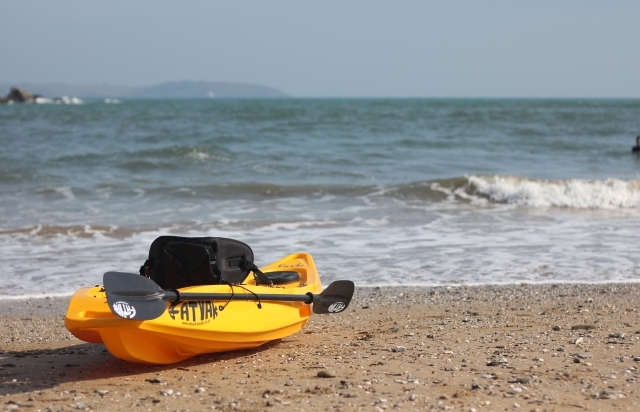 Summing up the Fatyak Kaafu is easy, It’s a fantastic all round kayak that would suit people of all levels for a variety of uses. It’s great tracking, coupled with its awesome storage makes it fast and excellent for touring and exploring the coast. The Kaafu is also well suited for playing in the surf as it’s agile and brilliant fun in the waves. Your fishing needs are also covered with the Kaafu, as it has lots of area for storing and tying tackle and is really stable. As a Fatyak Kaafu has lots of room for additional extras, such as rod holders and fish finders, It’s suitable for everyone from rookies to fishing pros. I’d really recommend the Kaafu for anyone that wants a well made and high quality kayak, that is great for loads of different activities. Have a look at this video of the Fatyak Kaafu in action.